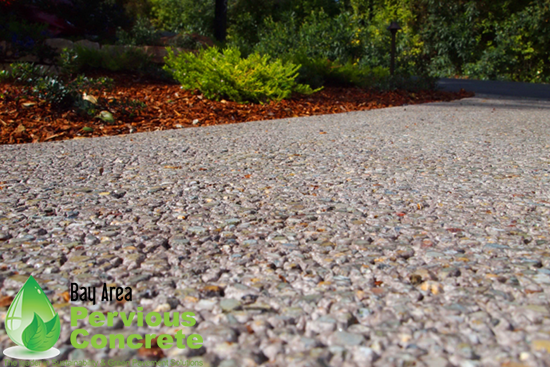 Residential Driveways Using Pervious Concrete - Mother Nature Approved! Pervious concrete helped this residential development meet the Provision C.3 in the Municipal Regional Permit - which require site designs for new developments and redevelopments to minimize the area of new roofs and impervious paving. Concord, among many other bay area cities, have restrictions on how impervious a development can be. Pervious concrete when incorporated into the stormwater control plan allows you to combine your hardscape with your stormwater management system - reducing costs and environmental impact, while increasing development space. Win-Win-Win! 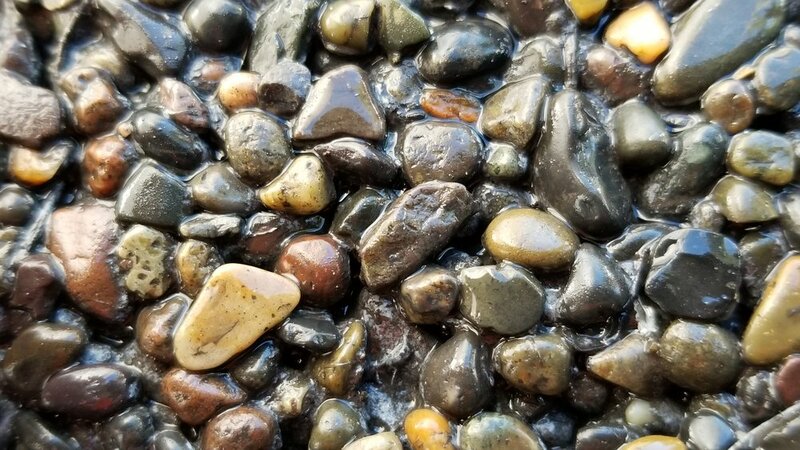 When we came up with Polished Pervious™ our Research and Development crew immediately saw the great possibility of using integral color with polished pervious concrete. Getting it installed on a project proved to take a bit longer - but now it is here and it looks STUNNING! 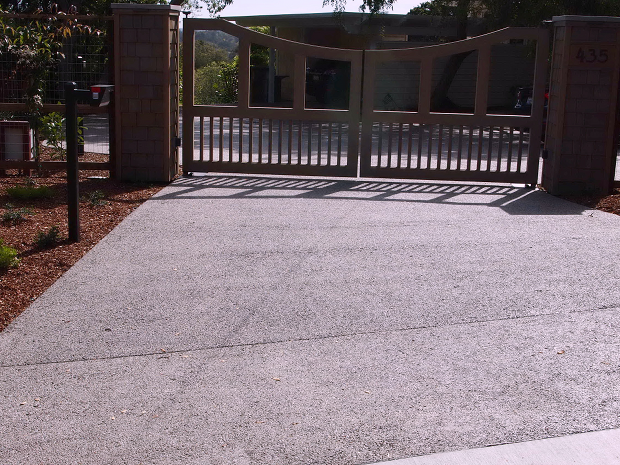 Polished Fine Pervious Installed in Los Altos Hills! 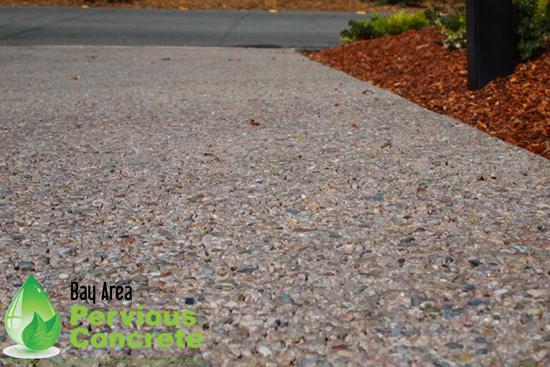 A new residence has installed a pervious concrete driveway - but what is special is the size of the aggregate! It is a 1/8 inch aggregate that polishes up beautifully! You can see this incredibly smooth and polished look starting at the gates and sweeping up to the front of the house. Pervious concrete is also featured around the parking pad in the back and there is a wonderful view of the valley below. All the photos in the gallery below! The client had flooding in the back and front of the house due to an uneven grade of the lot and excessive roof runoff. Driveway before- 'pervious pavers' that had settled and were not performing the way the homeowner had hoped. Sideyard before- muddy, and not very useful. He initially wanted a pervious concrete driveway because of impervious ground cover limitations in his city. We designed a pervious concrete driveway and side yard that is also the retention pond for all of the roof and yard runoff.The pervious concrete water retention system captures 100% of their runoff from the roof AND the lot. They now have a dry front yard, back yard and they can grill just off the kitchen without puddles! Sideyard after- Now this space can be used for laundry and garbage bin storage.